Who are you? Jan Wyatt. Owner of a restaurant, and therefore partner to a neglected woman. Father of five and master of none. Why Broadstairs? Beautiful beaches and friendly faces. First Thanet memory? Driving down the Thanet Way thinking I was driving over the edge of the world. Then arriving, looking out over Viking Bay. It was love at first sight. Was for me anyway. How do you define style? If you look like you are trying too hard, you haven’t got it. If you were an animal, what would you be? A Grizzly Bear. Looks cuddly but when fully shaven can look a bit offensive. If you could eat in any restaurant in the world where would you choose? St John, Bar and Restaurant. What’s the best thing about running a restaurant? I know it’s a vomit inducing cliché but every day is different and you do get to meet and work with some really good people. Best and Worst thing about your renovation experience? Best was finding 64 old chapel chairs from a Methodist Church on Ebay. Worst was getting a phone call from the Minister informing me I had just paid him with £400 of fake notes. If you could change one thing about the restaurant what would it be? My office. It is a converted urinal. Many customers from the old business don’t read the signs and rush through the door unbuttoning their flies. Do you have a bucket list, if so what is at the top? I would love to visit the Sextantio le Grotto della Civita in Basilicata, Italy. What is your biggest weakness? Ebay and Wine. They don’t mix well. If you could only eat three things for the rest of your life what would they be? Starter, Main & Dessert. If you could invite any famous figure past or present to share your dinner table who would choose and why? Caravaggio: The Painter. I would serve the food, pour the wine and listen to his story. Who are your heroes? Otto Karolyi. My Renaissance Studies lecturer at university. Katherine Hughes-Jones. The Cybil to my Basil. Describe your perfect day. It starts with the morning newspaper headline “Tripadvisor under investigation for fraud” and ends in me finding that recipe for Chocolate pudding my mum lost in 1985. In 10 years time where will you be? Broadstairs hopefully, older and wiser. But probably just older and greyer. Best advice you’ve been given? A seasoned restaurateur once told me, “Everyone is the centre of their own universe. Understand it and accept it. You’ll never be able to fight it”. I have found this to be true. ROUND-UP: Wyatt & Jones can be found under the historic York Gate, built in 1540 it still spans Harbour Street. It once held two heavy wooden doors that could be closed in times of threat from the sea. With now only the threat of getting wet in the rain or burnt by the sunshine, Wyatt & Jones has found itself with undoubtedly one of the best views. The interior has been carefully considered combining old church chairs and timber furniture, contemporary but pared back lighting and the feature stained glass depicting the York gate remains. 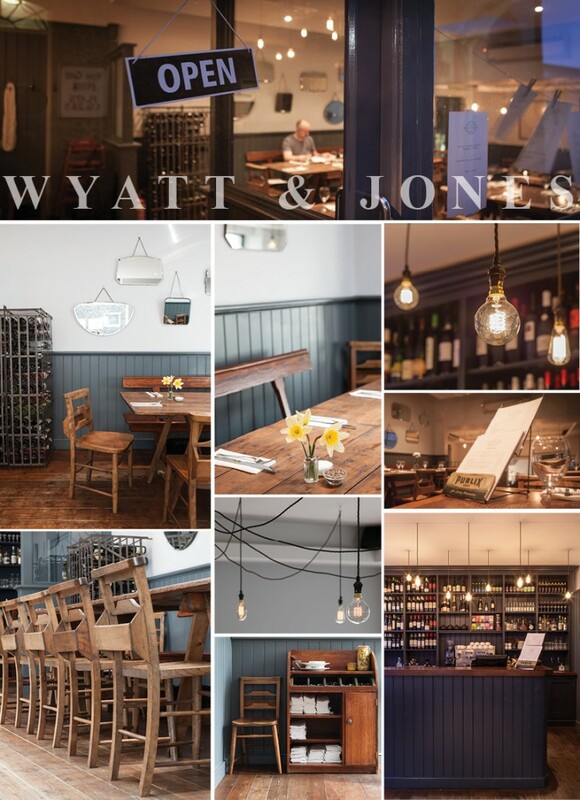 With cool and consistent greys throughout, Wyatt & Jones have achieved a relaxed and understated stylish interior. 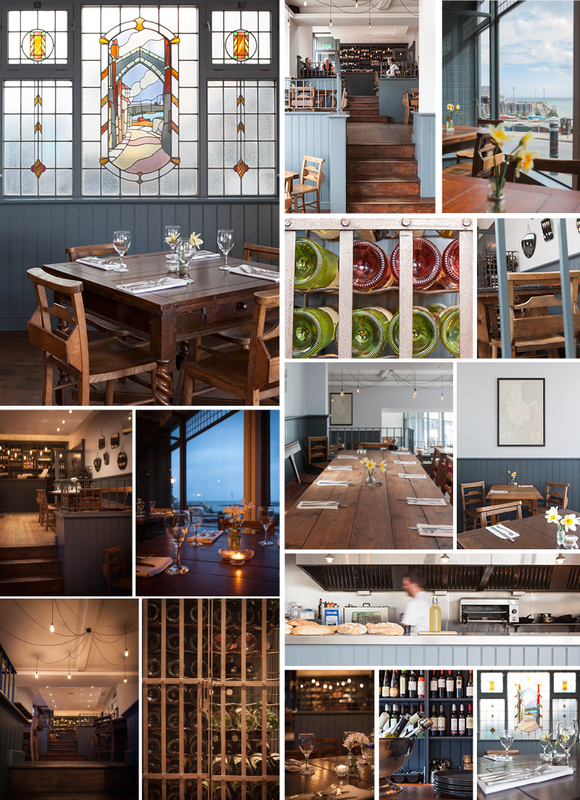 Wyatt & Jones, 23-27 Harbour Street, Broadstairs, Kent CT10 1EU.